In other words, these are podcast growth and marketing strategies we've covered in this first season, and I would love to provide a view back on these. In my comprehensive podcast marketing guide I provided links to all the podcast directory entries where new podcasters should submit their show, and I dedicated an entire episode to that topic. Ensuring that your podcast is easy to discover on all existing podcast directories is the most important initial marketing step to take for your new podcast. And even veteran podcasters should review new arrivals on the podcast directories scene about once a year. We ranked each podcast directory based on their popularity and by how many visits each directory website gets. There is an increasing list of podcast networks where we can submit our podcast for consideration. We used a free web service called Similarweb to see how popular each directory really is. You can take the point of view that submitting to any and all directories does not take much work, and that such stats don't matter. But I still found it interesting to see how popular some of the smaller directories are in terms of the traffic they generate. Anyhow, for new podcasters, directory submissions are the first step in any podcast marketing checklist. And this was the topic of our first episode. You can find the list of directories and stats at PodcastGrowthShow.com/e1. Getting your podcast guest to help with promoting your podcast episode is more tricky than you might think. Episode 4 is how to make it easy for you both. Many podcasters have an unspoken assumption that their podcast guest will promote "their" podcast episode. But it's important not to fall into that expectation trap. And depending on your own personality type, asking explicitly and sending multiple follow ups may not be in your nature. Especially if your guests don't follow through. I hate sending follow up and reminder emails. Episode 2 reveals why “Podcast Guesting” is one of the best possible marketing strategies for podcasters. And in our tutorial video we show step by step how to automate a highly personalized "podcast guesting" outreach campaign. The primary benefits come from the fact that being a guest on someone else's podcast instantly overcomes one of the more difficult and expensive marketing challenges: reaching podcast listeners in the first place. These sorts of outreach campaigns are time consuming, unless you know how to automate them, or are ready to hire someone else to do the heavy lifting for you. As is so often the case, you have to spend either time or money. As a result there are several paid programs out there that teach why this is such an effective marketing approach for start-ups, authors, speakers and entrepreneurs to create PR and promote their business. So episode2 was all about is to provide you with 2 options for taking advantage of this great marketing tactic. If you are the DIY type on a budget, but have the time and are willing to learn: Episode 2 offers email outreach campaign templates, swipe files, video tutorials and free automation tools and how to use them to run your very own podcast guesting campaign. If you are short of time and patience, but are willing to spend some money to have someone do this for you: Episode 2 lists several programs and services you can sign up for. You can find our entire downloadable Outreach System, guesting templates and resources at PodcastGrowthShow.com/e2. How effective are paid podcast advertising strategies, and do they work for podcasters trying to promote their show? Which ad platforms are the most effective? And which are the most affordable? In episode 3, we took a look behind the scenes of 3 platforms, Google AdWords, Facebook and Podcast Ad Networks. Using paid ads for promoting a podcast may not be for everyone. A lot of casual podcasters are in it just for the fun. If their show grows organically, fine. But spending money on ads is not something they’d consider. If you are a business getting into podcasting as a way to sell something, stop. This listening modality is very different from interrupting an audience with a paid ad in the middle of browsing through their Facebook feed. So the “getting to know, like and trust” factor is huge in podcasting. And this is why Podcast Listeners are such a lucrative audience. You get to offer solutions, entertainment, education – and present your core ideas to them. But this takes the vision to invest in a longer term “inbound” strategy. My personal experience has been that paid ads for podcasts are usually most appropriate for businesses that have a solid web, social and PPC presence already. It can be one piece of the puzzle, and serve to attract an ideal audience into a marketing funnel. Conversely then, for solo podcasters focused on getting more listeners, it's an expensive way to do that, all things considered. That said, Facebook is generally more affordable and flexible than Google Ads. Targeting podcast listeners is not easy on Google AdWords. Facebook makes this a little easier, and one of the resources we share in Episode 3 is our downloadable 5 step process for targeting podcast listeners on Facebook, in case any podcast listeners are experimenting with Facebook Ads. Episode 3 also explores a 3rd option, which is to create your own audio ad and advertise on podcast ad networks like Midroll, Advertise Cast and others. This approach solves one of the issues that Facebook and Google ads do not address: Presenting your podcast to podcast listeners only. 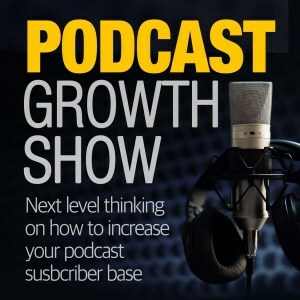 Visit PodcastGrowthShow.com/e3 to learn more and download our 5 Step Facebook Targeting process. Podcast launch marketing with contests is still a great promotion idea. Episode 6 covers how newly launched and older podcasts can attract fans and subscribers using contests. A few years ago podcast contests and give away used to be mostly associated with podcast launches, when that was an effective technique of boosting a new show into the new and noteworthy section of iTunes. Mostly the focus back then was to gather reviews on iTunes in exchange for being entered into a social contest of some sort. I would also propose that reviews are still important and should not be ignored. They lend credibility and social proof to a podcast. Seeing that dozens of people are leaving great reviews for a podcast you might enjoy might tip the scale for you to take action and subscribe. On the other hand, seeing a podcast on iTunes with no reviews at all also tells you something. While I have not personally used all of the contest platforms out there, we review a number of free and paid platforms in this episode. As I often do, I like comparing free vs. paid solutions. I am always curious to decide for myself if a DIY approach is worth the effort, or if there are good free solutions for those of us on a budget. In this case, my own view and recommendation was pretty easy to come by: If you decide to run a podcast marketing contest, I recommend using a paid contest platform, as this will save you a ton of time and effort. Apart from getting iTunes reviews, a podcast marketing contest with the right prizes and incentives can quickly add a ton of visibility, and perhaps more importantly email subscribers, to your podcast. As a former UX design lead for a company, I am a bit of a conversion optimization and web design wonk, so forgive me for getting excited about this topic. This episode and complete walk through video explores why podcast website design should focus on email list building instead of on iTunes subscribers. It offers a design pattern optimized for increasing your podcast subscriber email list. What we are talking about is a highly converting podcast homepage design pattern called “The Upside Down Podcast Home Page” – optimized to create a guided experience for your site visitors, and to encourage them to subscribe to your podcast via email. Episode 5 is pretty visual for a podcast, so apologies if you're listening to this. I'd suggest jumping over to PodcastGrowthShow.com/e5 to view walk through video which covers 2 versions of this podcast home page design pattern – a more complete version for established podcasts with multiple seasons or topics, and a simple version for new podcast sites with a narrow niche and a focused audience. You can also grab a downloadable annotated PDF of the podcast home page design pattern on our podcasting resources guide. Well, not from my point of view. For a number of reasons: The iTunes podcast ranking algorithm as well as the “New and Noteworthy” top 100 charts are seriously being gamed at the time of this recording. They are full of entries who are paying thousands of dollars to overseas click farms for instant presence in the top charts. This is not just my opinion, but has been extensively covered in the podcast news beats. If you want to see a comprehensive video explaining how this is the case, and what the impact on the iTunes ecosystem is, just watch this video by Lime Link. But even today it is still one of the most valuable assets your business can build. And this applies to your podcast as well. The fact is that you can provide your audience with more valuable context, and you get to better position your episodes through the email notifications you send. Should you still encourage your listeners to subscribe on iTunes, Google Play or Stitcher? Of course, but it is better to do so after they have opted in via email. The 5 reasons I gThis applies mostly to people who have decent podcast show notes, additional content that complements and extends the value for your listeners, with links to your guests and resources you feel are helpful to your audience. I am not proposing to avoid Facebook or social platforms, to the contrary. What I am saying is that all social and ad traffic to promote your podcast should land on your own great conversion optimized podcast home or episode pages. As I mentioned earlier, I particularly like “The Upside Down Podcast Home Page” design pattern for this. Check out PodcastGrowthShow.com/e7 for details. Ok, so now that we've gotten my pet-peeves out of the way, I guess it's pretty clear that I focus a lot on how your podcast show notes can be a central vehicle for promoting your podcast. So, episode 8 explains how we get the most from our show notes. When we publish to iTunes, we are already distributing our podcast, right? After all, between iTunes and our RSS feed our podcast lands on all the major important podcast listening platforms. When podcasters market their show, RSS feeds and podcast directories are only a part of the story. We're missing something in our podcast marketing checklist, and, in Episode 8 we discover what that is, and a platform to help fill this gap. This results in greater traffic and discoverability, as well as greater backlinks and more site authority. When your episodes go live, you probably already share your show notes post on Facebook, and perhaps on Twitter. But have you thought about publishing your episode show notes as articles on Medium? (I get a lot of traffic from doing this) Or on Blogger? Or to an Ambassador network? Disclaimer: the above is an affiliate link, should you ever decide to upgrade to a paid plan I will earn a small commission at no extra cost to you. My site is pretty much free of endorsements, ads or affiliates, and this is an exception: I truly believe in this platform, and it has provided great results in syndicating our own and our client's podcast show notes. As we are wrapping up season 1 of the Podcast Growth Show, I thought it was time to zoom out for the big picture in episode 9, and at the same time zoom in to and reveal the specific workflow we follow. Episode 9 is not meant to be a guide or recommendation or podcast marketing checklist of any sort, this episode is merely about how we approach our planning to execution, and some of the challenges of producing both video and audio for a podcast season. For those of you who follow us, you realize that we often talk about “podcasting as a content strategy”. So this episode is structured into several segments. This entire season has been about how to promote a podcast. So we may already have covered some of the methods we use to promote each episode. If you are curious and want to check it out, I'd invite you to PodcastGrowthShow.com/e9 for our entire workflow. You can find some cool infographics, free access to the SEO research tools we use and free sign ups to our content syndication platform. Again – episode 9 was just the process we follow because it is producing results for us. I do not recommend it to everyone, and the fact that we are producing video alongside the audio portion complicates things a bit. I want to express gratitude to you, our listeners and readers, and to all the folks that have taught us, as well as to the podcasters we are lucky enough to collaborate and work with. Season 1 was a solo effort, and I'm still in the process of formulating what we want to achieve in Season 2 and 3. But one thing I know, I am looking forward to sharing some great conversations and insights from other podcasters out there, and what is working for them in promoting their shows. In the meantime, here's to better podcasting and podcast promotion. One last thing I almost forgot is the ambassador network. If you'd like to join my podcast marketing ambassador network, I would hugely appreciate it. When new episodes go live, you will receive an email inviting you to share the episode on Facebook, Twitter or other social networks. If we have complimentary topics and our content is in sync from an SEO, or Inbound Marketing or podcasting perspective, this is a great way to support each other. So here is a signup form where you can join my ambassador network. I would love to have you be part of that, and I would love to be able to support you in any way that I can.